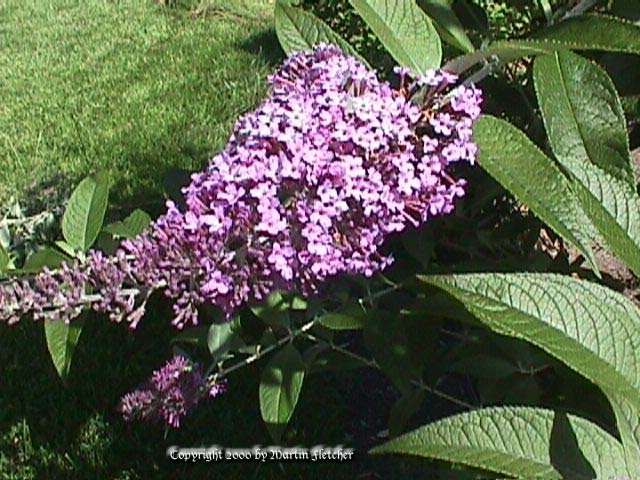 The Lavender Butterfly Bush, Buddleia Lochinch is a little smaller than the average Butterfly Bush but still all of 8'. The branches of Buddleia Lochinch are fuzzy and white. The flowers weigh down the branches so they arch. In full bloom Buddleia Lochinch can be quite spectacular. Buddleia plants perform best with regular pruning. Due to the pleasing character of the branching structure of Buddleia Lochinch I usually selectively prune out the older branches. By the third season the branches will die, and even during the second season they perform poorly. So removing them improves the health of the plants. Buddleia Lochinch prefers good soil but will perform quite well in difficult conditions. Plants are hardy to 0° F or lower, far below any conditions we are likely to get here in California. Buddleia Lochinch is a popular nectar source for the Red Admiral Butterfly, Mournful Duskywing and others and with hummingbirds and is a great addition to the butterfly garden. Buddleia plants frequently produce seedlings, while this is not a problem in most garden settings, care should be taken if planting near wildlands. Flowers and foliage of Buddleia Lochinch Lavender Butterfly Bush. High resolution photos are part of our garden image collection.